Sour. Sweet. Crunchy. Elegant. Fast. Now this looks like a good time. 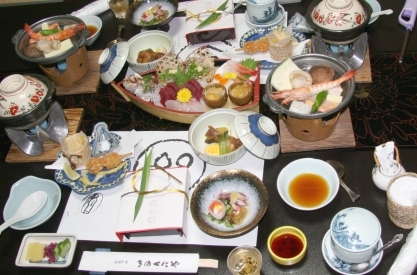 A Japanese feast, with all kinds of dishes from sushi to shabu-shabu. I wish I could find a better picture, though, so I could zero in on the small rectangular dish at the bottom left-hand corner. Japanese pickles are different from Western ones. The Japanese ones have more of the vegetables’ natural flavour, and they can be seasoned with all kinds of different ingredients – miso, rice bran, chilis, shiso leaves, sometimes even the leftovers from the sake-making process. 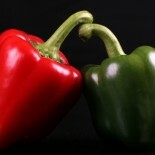 There are many different varieties, and they go far beyond cucumbers with their vegetable choices. They’re a delightful way to get more vegetables into your diet. Their flavours are subtle, elegant… and addictive. Like the ones the Americans use for pickles? Ok. Thank you. I’m so sad. The table looks wonderful. I said i would dry myself out crying and I have. I keep looking for him. Slowly it’ll get better I know. Oh I was born in england. It’s a process, losing a pet. I’ve lost them before too. The immediate part is always the worst. Eventually only the happy memories remain. I’m thinking of you. Stay strong. I’m afraid I’m not being strong at all. I had to send one off a few years ago and that was pretty bad but now I can’t stop crying. Maybe because he’s my last. This entry was posted on May 2, 2013 by thinkreadcook and tagged Chubby Hubby, cooking, food, Japan, Japanese, nutrition, pickles, recipe, vegetables.